The Houston Chronicle recently spent time with Saleha Khumawala, C. T. Bauer College of Business Robert Grinaker Professor of Accounting and SURE™ Program Founding Director Saleha Khumawala, to learn more about the Bauer College program that is empowering underserved entrepreneurs in the Houston community. Thank you for bringing notice to the work SURE is doing! The SURE program was easily one of the most landmark experiences of my MBA education. I would highly recommend if to all Bauer students interested in consulting or entrepreneurship. Dr. Khumawala and Charlie are amazing! Dr. K is awesome! As a SURE alum I am so excited to see her getting this kind of attention. Because of these articles, SURE is able to expand its platform and that’s what Dr. K would want. The SURE Program helped me understand the business part of my work especially the part most business owners are confused about, finances. SURE provides so many resources no matter where you are in your business. Most importantly, Dr. K and and Charlie Becker make sure we are a family. We all encourage, support and uplift each other well after our time in the program. I would recommend SURE to small business owners and start-ups. It will definitely change the way you see business and do business. Congrats Dr. K you ROCK! I am grateful to be part of the SURE family! The SURE program is one of the premier experiences that Bauer is offering so that MBA students can advance their careers. We have the opportunity to make a valuable impact on the underserved communities in Houston, while also adding real-life experience during our time as students. It’s been over a year since I participated in the SURE Program. Dr. K’s passion and enthusiasm for aspiring entrepreneurs is exactly what one needs when first getting started. I’ve participated in a few start-up/entrepreneur programs and this program definitely exceeds the rest. Thank you University of Houston and Dr. K for your passion to help small businesses! Great experience. It was a pleasure meeting new entrepreneurs and learning at the same time. 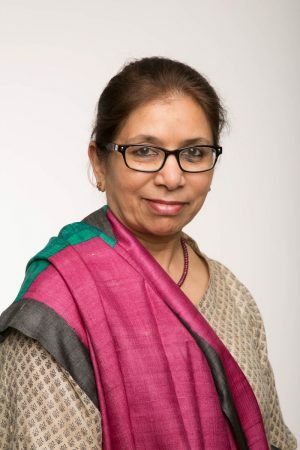 Professor Saleha Khumawala’s SURE Program at the University of Houston CT Bauer College of Business demonstrates the strength of the human spirit as the “under-resourced” demographics are empowered while they work their dreams of becoming business owners into reality. The SURE program was one of the first experiential courses I took during my MBA at UH, and I can’t recommend it enough. This program gives you the ability to gain experience as a consultant with real entrepreneurs running real businesses. During the weekly sessions, you have the chance to learn from and meet with speakers from some of the nation’s strongest firms in finance, accounting, and consulting. You come into the program looking to build a business plan, but what you come away with is much more than that. Being in the SURE program was a really great experience for me and is a very good place for entrepreneurs starting out to learn about business. Dr Khumawala, Charlie, the student mentors and the guest speakers were great. I found GREAT value being a participant of Dr. Khumawala’s SURE program. This “MBA-bootcamp” gives practical application to small business owners through CEO insight, Professional advice, resources/tools and providing the business acumen that entrepreneurs to succeed and scale in a market positioned to grow, in Houston. At the University of Houston, Bauer executive training level with the oversight of Dr. K and Charlie Becker, SURE entrepreneurs get the training they need— which is second to none! Explosive, Relevant, Dovetail teaching and learning to the core. Everything you need to know from A-Z about entrepreneurship, from start up, to sustainability. Racially, Age and Gender Diverse. Creative, Innovative and Fun. Priceless Exposure, Dovetail, Vast Teaching and Learning to the Core. Thanking God for the opportunity to have been an active participant.